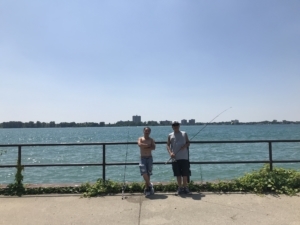 One of my favorite moments of my impact project was meeting these gentlemen who fish weekly at Alfred Brush Ford Park. This park is located in a floodplain in Detroit and will become a very important element to maintaining this community’s resilience as the neighborhood changes and develops. Over the last two months, I worked for the City of Detroit Office of Sustainability on my Challenge Detroit impact project. This partnership was especially fitting for me, as I remember way back to the first weeks of Challenge last year thinking “Wow, how cool would it be to help the Office of Sustainability next year for my impact project?” One year later, and I’m so glad to have seen this through and work with an amazing team doing even better work. My impact project focused on how the City of Detroit can improve it’s flood rating through FEMA. This rating (confusingly entitled the Community Rating System (CRS) class) is a measure of how flood resilient a city is. In turn for being more resilient and “prepared,” a community can help its citizens receive discounts on their flood insurance policies. I looked at ways that the City of Detroit can use public information and outreach to both receive points for the CRS and increase awareness about flooding in Detroit. One of my greatest insights about the project was that sustainability efforts can, without proper communication, be a jargony, elitist and inaccessible. For example, from my research, the FEMA floodplain amendment process is guided by a 300+ page manual and any related documents and ordinances about flooding are convoluted and difficult, even for me, to read. From the very beginning, my project liaison, Betsy, and I set out to craft a project that was all about making sustainability issues accessible and digestible to all audiences. We looked to how other communities have done it for best practices. We considered ways to bring sustainability conversations to people in the places it affects them most. One of our initial ideas involved teaching Detroit residents about the benefits of urban trees at the City of Detroit’s cooling centers. Though that idea did not work out due to timing issues, it provided me a foundation for how to broach the subject of sustainability in the future.